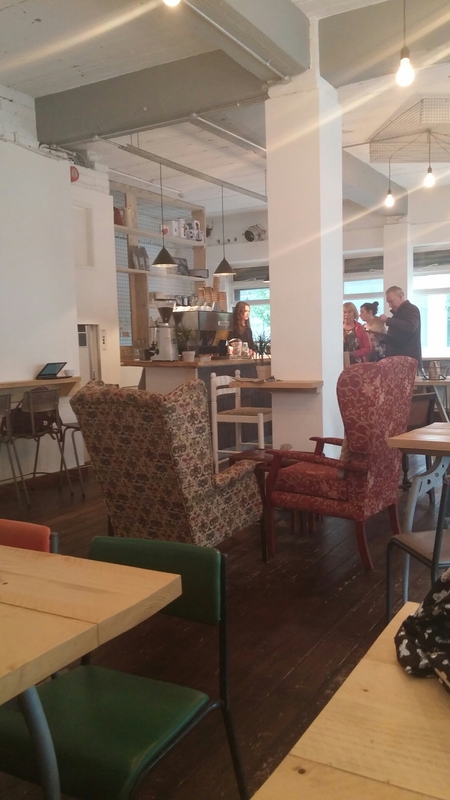 I have walked past the Little Man Coffee Company in Cardiff on a myriad of occasions (it being on one of my routes for a lunch time stretch of the legs – with my job being very sedantary in nature I need this), but I had never previously ventured in. I had, however, heard many a good report about the place on Twitter (it also gets good write ups on Tripadviser). So when it came to choosing a venue for a catch up lunch with J it seemed an obvious choice. This was especially the case with J being on her fourth lunch out of the week in question (on top of, apparently, a heavy weekend) which meant she was looking for a lighter lunch!! Situated opposite Admiral Insurance’s shiny new headquarters in Cardiff, it has an enviable position. Lots of passing trade I image. Inside it is somewhat understated with an eclectic mix of seating. All the furniture is apparently from reclaimed stuff. It is a little sparse, even for my minimalistic taste. Be warned, it does have a step up right inside the entrance which I (clumsy oaf that I am) tripped over. I had by “accident” left my wallet in the office so lunch (not she sure believed me) was on J!!!! 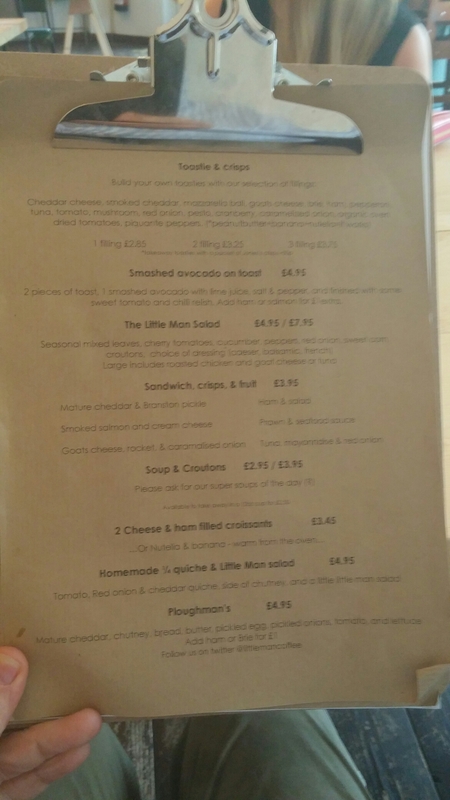 The food menu at Little Man is small but pleasingly formed. 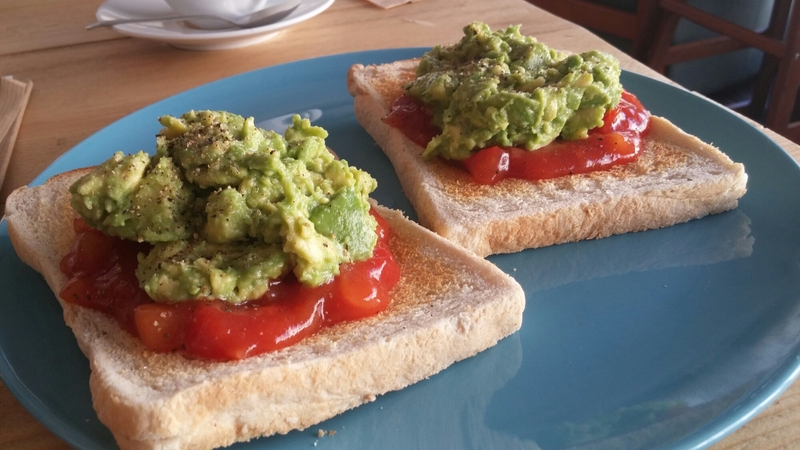 as I love a bit of avocado and was torn between this and a toastie, but after much humming and hawing was forced, by a “bloody get on with it” look from J, to make a decision. Toastie it was. 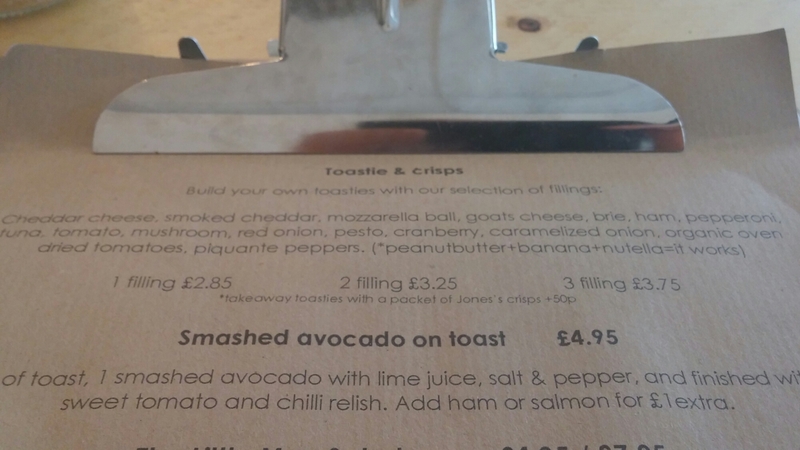 The toasties operate on a build you own basis (from a choice of fillings), with a fixed price linked to the number of fillings you choice to add (1 filling for £2.85, 2 for £3.25 and 3 for £3.75). There is an option of (not very exciting plastic) white or brown bread. I went for white (can’t usually be doing with the basic brown bread) with a filling of mozzarella, ham and picante peppers. This was very nice with gooey mozzarella, nice proper ham and sweet, tangy peppers (like pepperdew ones). My only slight gripe was the portion size (especially that of the accompanying pot – well tiny ramakin – of crisps) which was a bit on the mean side. The plate (like the place) was very minimalist, although I personally didn’t miss the lack of any salad garnish (usually utterly superfluous). What I really could have done with was a bit more portion size wise. Perhaps use of a chunkier bloomer loaf/pannini would do it, as the standard white slice is a puny, slightly pathetic thing. 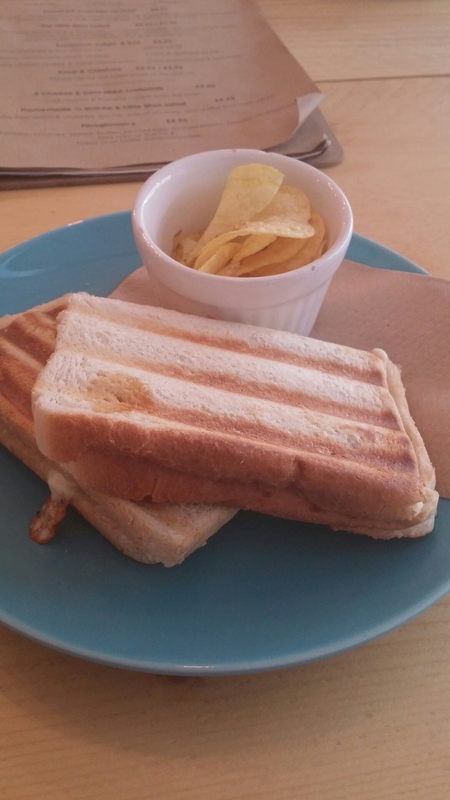 My toastie looked more suited to a “littler man” than the piggie I am. J decided on the homemade quiche which was a much better portion size. It came with nice looking salad (J strangely asked for no dressing – I hate undressed salad – but the option of three good sounding dressing was available ), a nice pot of chutney and a mound of chunky croutons (slightly odd addition I thought – which I ate as J’s continuing weirdo diet forbade it!). 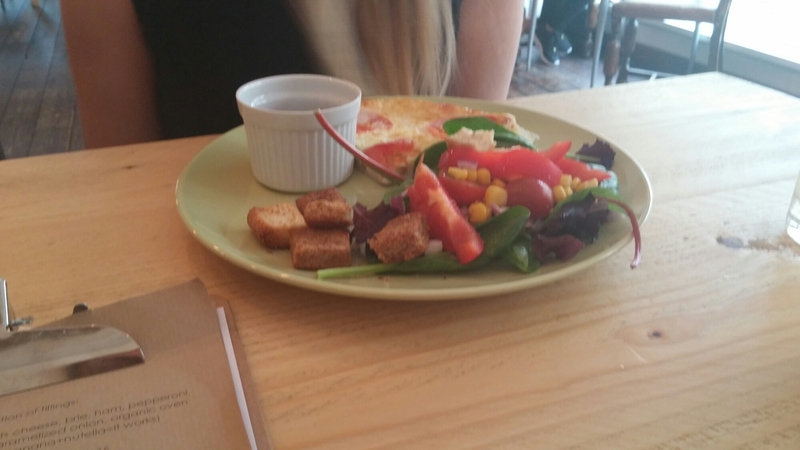 J was happy with her choice, commenting that it was a good quiche with lots of flavour. and a lemon drizzle one. 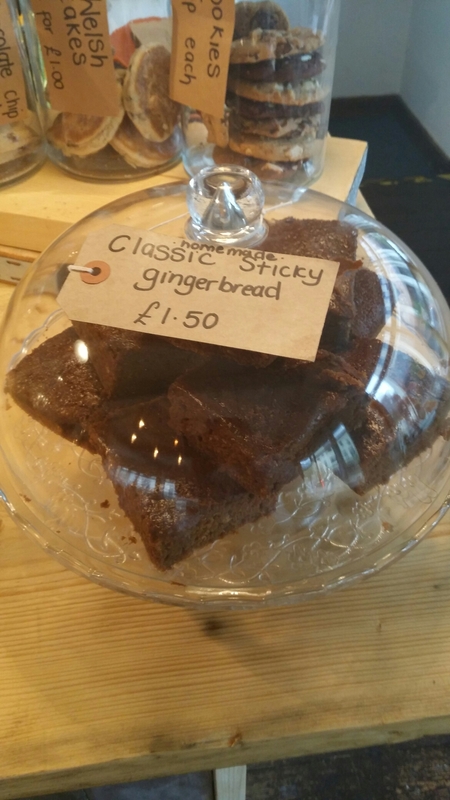 I plumped for the sticky ginger cake which was nicely flavoured (personally I would have preferred more ginger, but in my view there can never be enough ginger in a ginger cake) and not in any way dry (J said I could not under any circumstances use the word “moist” to describe it, as she hates the word). 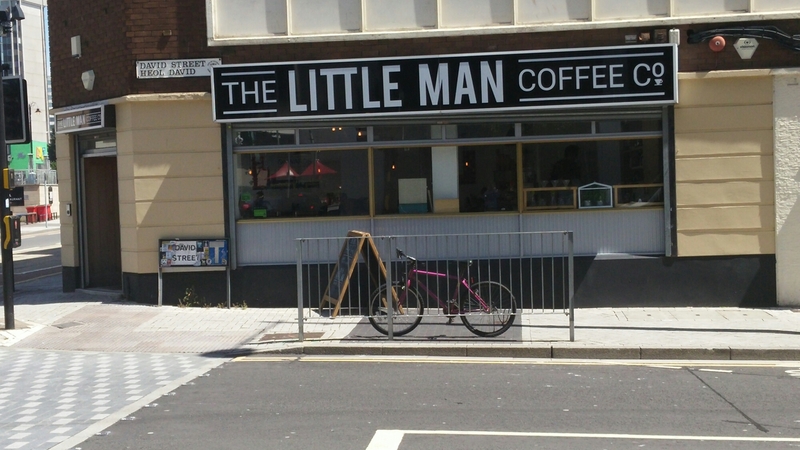 As a coffee shop, the Little Man Coffee Co. prides itself on the coffee it serves, with the website referring to its coffee being sourced from all Welsh based roasters ( Welsh Coffee Co., James Gourmet Coffee Co. and Coaltown Coffee Roasters). 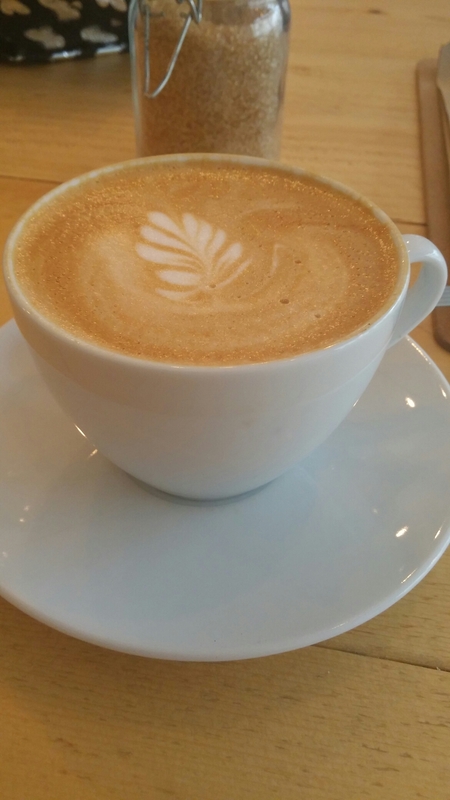 I had a flat white which had a lovely rich aroma and flavour, with very pleasing caramel notes. 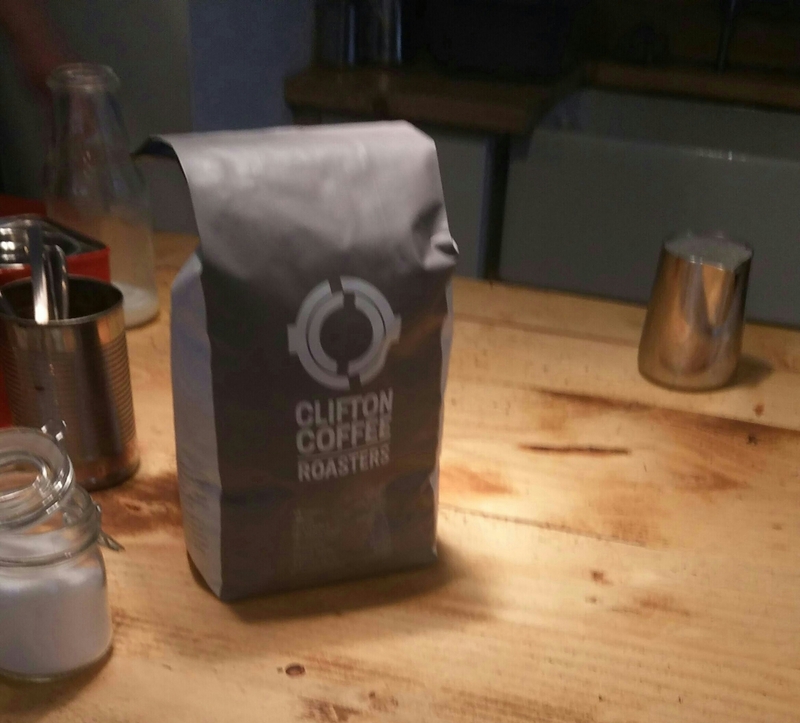 I am not sure what specific coffee it was, but I did notice on the counter a bag of coffee from Clifton Coffee Roaster (not Welsh, but from over the border “Bristol”). Regardless of its provenance, this was good coffee miles away from the thin, bitter, insipid stuff the chains seem to offer up these days as gourmet coffee. 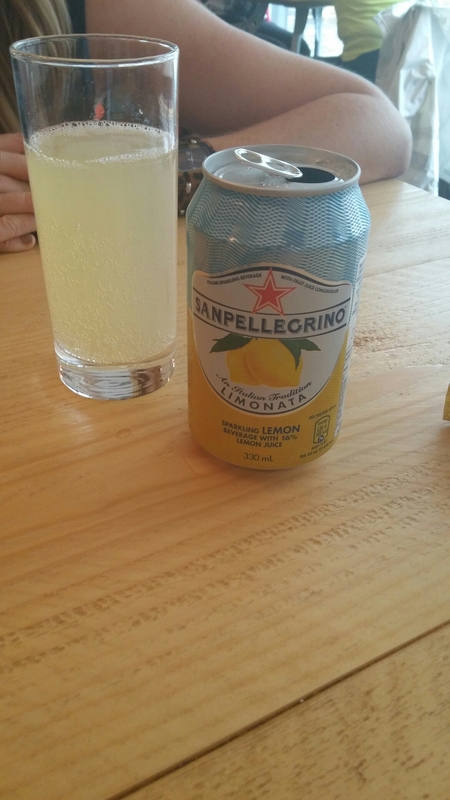 as well as a decent selection soft drinks drinks (J has a limonata – despite my protestations that the place had coffee in its name so she should order a coffee). 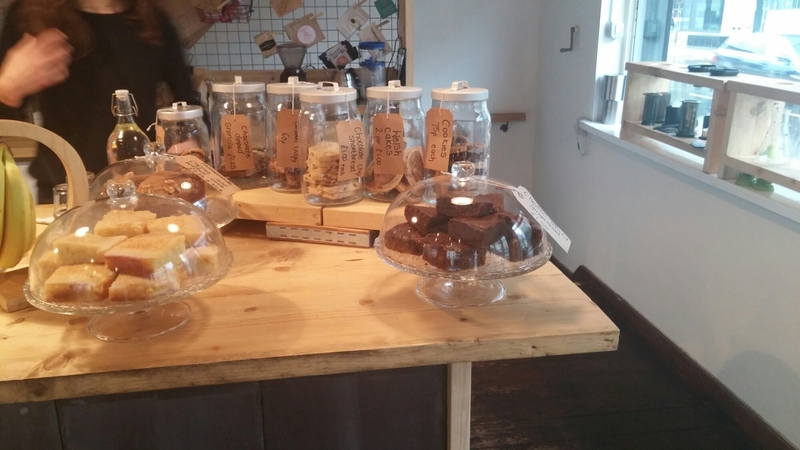 I liked the Little Man Coffee Co., which to me is a nice little spot for a coffee, light lunch and a good old natter. My only real cause for a moan was that the portion size of my toastie was a bit “little man” size (I am a bit of a pig mind), but it did taste very good (down to my good filling choices, of course, and the quality of the ingredients used). Would I go back? 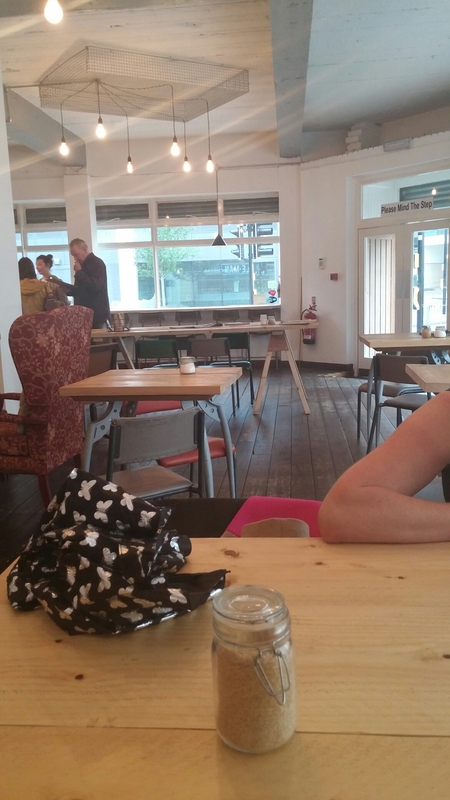 Yes – good coffee and a fair few things on the menu I want to try. and flat white coffee (an Ethiopean coffee which had a lovely nutty flavour to it – probably should have drunk it black). Again only critisism regarding this was their use of bog standard puny white sliced bread. Cost wise both visits came to about £7 (J paid, on first visit, due to my wallet malfunction so not 100% sure as to cost of that visit), which I thought was ok value, notwithstanding the use of plastic sliced bread in the dishes I ordered on both visits. Have to say as they sell (at the counter) loaves of artisan sourdough, why not use those instead? They do use that “proper” bread for some items (their bruchetta, for instance), so why not for all? Would be a lot better than plastic white bread in my view. Although it can be difficult to create drip coffee, you can make it better. oil works great, but some prefer a more professional approach. 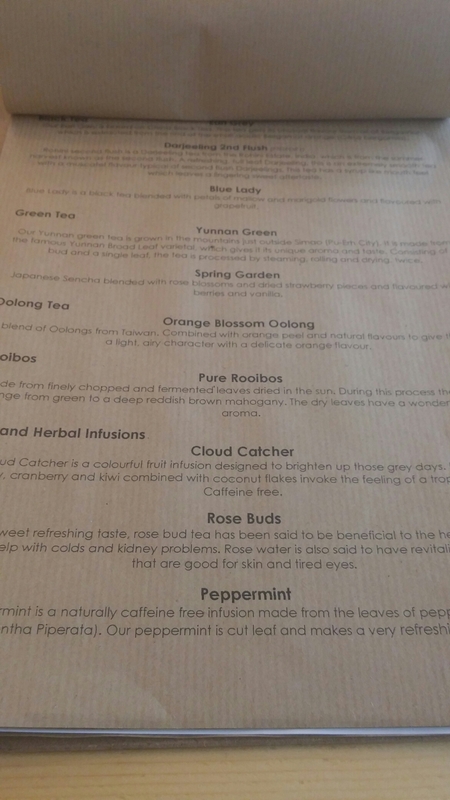 This entry was posted on Jun 21, 2015 by solicitingflavours in Breakfast, Cafe, cake, Cardiff, coffee, Food, Little Man Coffee Company, lunch, lunchtime, New restaurant Cardiff, Restaurant Review, Sandwich, Take away, Tea, Wales.